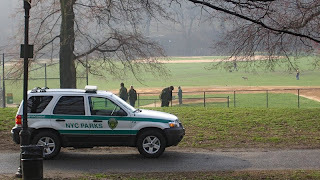 We were cycling past the baseball fields at 8:30AM when we spotted a Parks Enforcement Patrol vehicle and 2 officers. 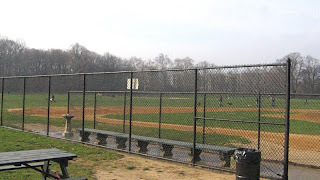 There were several dozen unleashed dogs running around on the baseball fields and we assumed that the police were going to enforce the leash rule. They didn't; in fact they couldn't have looked less interested. A couple, whose dog had been running around on the fields moments before, walked right past the officers. They said nothing to the couple and ignored the still-unleashed dog. * Dogs must be on a leash (no more than six feet long) at all times, except in dog runs and designated off-leash areas at prescribed times. * You must pick up after your dog and dispose of the waste in containers provided throughout the park. * You must prevent your dog from chasing birds, squirrels, and other animals. * Dogs are never allowed in playgrounds, zoos, swimming pools/facilities, bathing areas/beaches*, fountains, ballfields, or on basketball/handball/tennis courts. We spoke with a park grounds worker who was completely disgusted by the situation as they complain to their bosses constantly, but nothing is done. 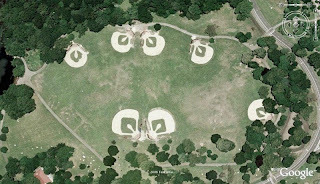 The last image above makes clear where the ballfields are. 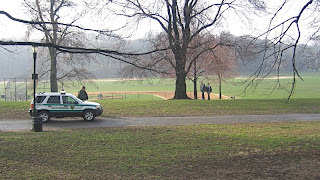 Wonder why the City Council has never had any hearings on unleashed dogs in the parks? Helen Foster is chairperson of the Parks & Recreation committee and, by this report, seems to have better things to do than come to the office.